Abbot Kinney to Food Trucks: 'No Parking, Vehicles Over 6 Feet High' - Yo! Venice! Vehicles that are over 6 feet high are no longer allowed to park within 100′ of the intersections between Westminster and Venice on Abbot Kinney. 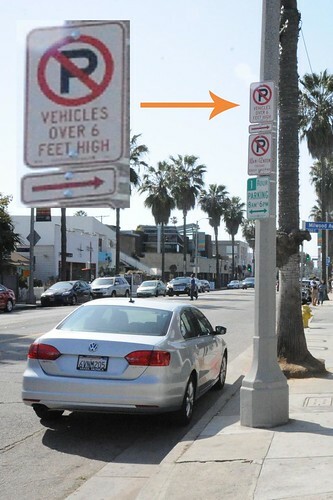 The signage was approved and placed by the LA City Department of Transportation at the request of the Abbot Kinney Merchants’ Association to improve visibility at the intersections. In addition to improving the safety at intersections, the new signage will also limit the amount of food trucks that will legally be able to park on Abbot Kinney during “1st Fridays”. Then again, if the trucks are not towed after the $58 ticket, the food truck owners may just write it off as the cost of doing business. We will see what happens tomorrow! While a Range Rover with stock wheels will slide under the 72″ restriction by 1/2 an inch, some SUV’s like the Ford Expedition will not, as they are 77.2″ in height.